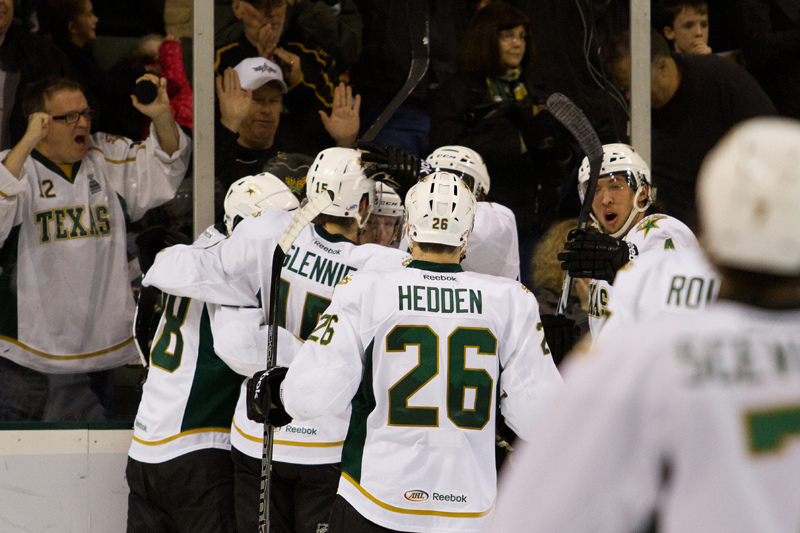 In what will likely be his last game as a Texas Stars, Cody Eakin had a heck of a finish. Eakin scored the game-winning power play goal in overtime to complete Texas's three-in-three weekend with three wins and the full six points. "We've battled hard for all the points this weekend," said captain Maxime Fortunus. "It's always a battle against Houston. It's a big rivalry." Eakin pointed to team play as the reason for success: "We've been rolling. We've been playing a lot of good hockey. Chip-ins from everyone tonight from the first to fourth lines." The Stars did get goals from everywhere as Maxime Fortunus, Reilly Smith and Mike Hedden collected the other three Stars goals. Overall, the teams combined for 21 penalties in a chippy game. Cristopher Nilstorp stopped 24 of 27 through 60:33. Texas got behind early in the first on the power play. Nick Petersen scored his second in as many games on the power play with a rebound chip shot to make it 1-0 at 3:27. "We didn't play a great first period," said Fortunus. "We knew we had to come back in the second." The Stars did storm back in the second, Reilly Smith scored shorthanded on a nifty move to trick Matt Hackett. Coming in quick, Smith slowed up a tapped a slow dribbler through Hackett's five hole on the backhand for the 1-1 tie. It was the Stars second shorthanded goal in as many games. Zack Phillips would score for the Aeros less than a minute later to make it 2-1. The goal, another rebound, came just as time expired on the Texas penalty. Before the goal could be announced, Texas had one more of their own. Mike Hedden had his first of the year, a great roofed shot off the right wing side. Max Fortunus went next for the Stars as a Tyler Cuma high stick put Texas on the power play. The captain finished off a great passing play with a wired one-timer off the left wing. "Our forwards have been playing very well. We've been working on jumping in the play and picking the right moments." Texas would go to the locker room with a 3-2 advantage after two periods. Houston would earn their point though by scoring a power play goal in the final frame. Johan Larsson found the rebound off Nilstorp's pad and went unimpeded around him and into the net for the 3-3 tie. Overtime was brief as Texas found itself on the power play, courtesy of a tripping call to David McIntyre. In the end, Cody Eakin popped the puck past Matt Hackett in tight on the right wing to claim the extra point and likely to cap his AHL career. The win moves Texas into sole possession of fourth place in the Western Conference, as Abbotsford was idle today. Speaking of idle, Texas will be just that for the next few days as they face Houston in their next game on Friday.